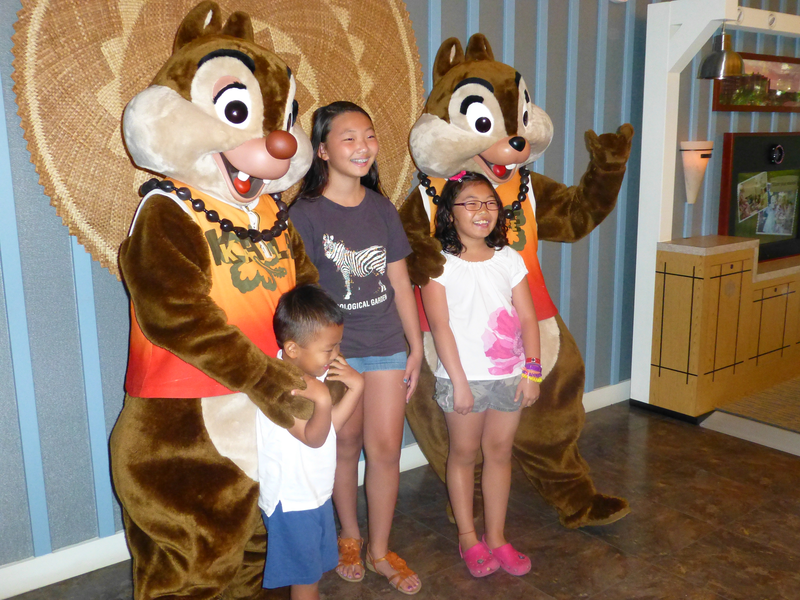 Guests at Aulani visit Chip and Dale. Stitch visits with room service. 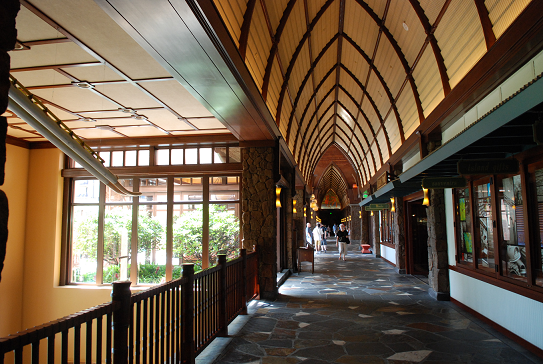 Even the Aulani hallways have a distinct Hawaiian feel. 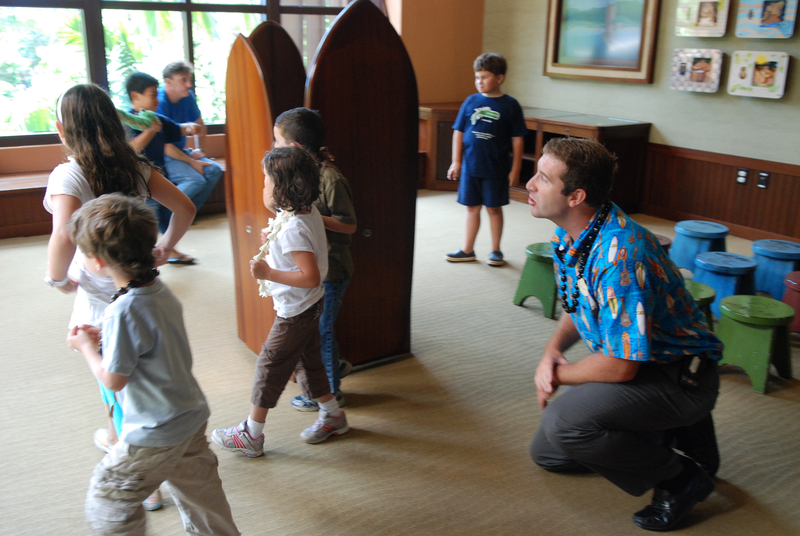 Daily activities at the Aulani kids club. Aulani towers over a pretty beach and resort pool. “Disney Goes Hawaiian” is how this family sees Aulani, the company’s first and already successful venture running a themed beach vacation resort not related to an amusement park. “This is AWESOME!” I crane my neck over the swells to see my 12-year old son Will ride the rolling blue water. Then my husband Bob pops up on his board and holds that Hawaii Five-0 theme song pose, looking real cool surfing all the way into Barbers Point Beach. If anyone would have told me I’d be thanking Disney for these fun family memories and bruised shins, I would have told them they’re high on pixie dust. But here we are surfing with Honolulu’s Hawaiian Fire Surf School on a Disney vacation. This seems unbelievable because we aren’t the textbook, or should I say storybook, family regularly spending our vacation dollars making Disney memories. Until now we had only two Disney chapters in our family’s travel photo albums, both when Will was 7-years old and he truly believed he could fly like Peter Pan. As the years passed, the pixie dust wore off and I figured our Disney days were done. The End. That’s until Aulani, A Disney Resort & Spa appeared on a Hawaiian island far, far away. 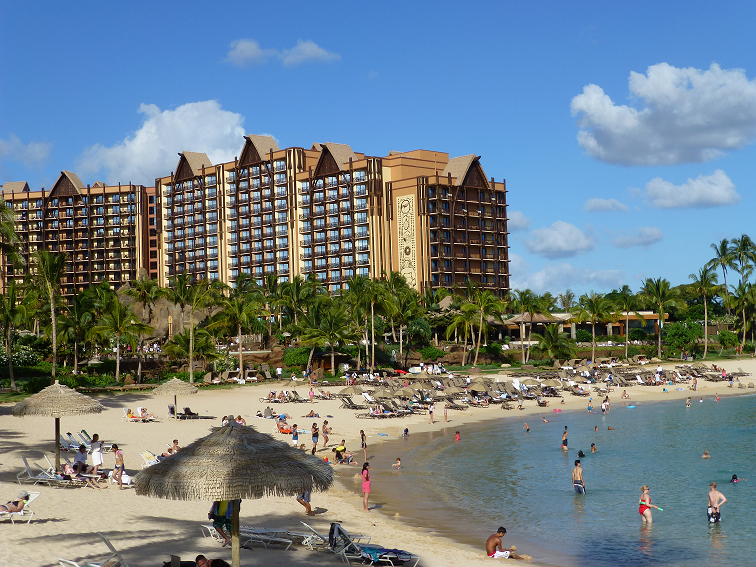 Want to plan an affordable Aulani vacation? And that’s what Disney’s Aulani has succeeded doing on the west coast of O’ahu. The only hotel-vacation club resort not located in a theme park delicately balances Disney magic and Hawaiian culture. No lines in paradise to ride a wave made Disney doable again for me and my ohana (that’s family in Hawaiian). While Disney imagineers certainly helped shape the Aulani guest experience, the mighty Magic Kingdom actually stepped down from the throne to pay homage to the legendary Hawaiian Kamehameha Dynasty, the royal family that ruled the Kingdom of Hawai’i from 1810 to 1872. Wisely, when designing Aulani (which means “messenger of a chief”), Disney consulted with the archipelago state’s chief cultural experts. The family beach resort’s architectural style, artwork, dining menus, entertainment, family programming and off-resort excursions authentically express Hawaiian culture, traditions, history, beliefs and island life today. Seventy noteworthy Hawaiian artists created Aulani’s decor and museum-quality artwork throughout the resort, thus making the Aulani the place to see the world’s largest collection of contemporary Hawaiian art. Hand-crafted, graphic tapa cloth panels decorate the walls of the lobby’s soaring triangular-shaped space replicating a hale (house) for outrigger canoes and village gatherings. The open-air lobby separates the hotel’s two wings. In keeping with Hawaiian belief in pono, or natural balance that’s infused in all existence, each hotel wing represents male and female energy symbolized by the water features, mural artwork, and natural construction materials. The front desk is backed by a montage of stunning island images photographed by local children. Smiling staff greet and wreath arriving guests with leis. Women receive fragrant white-yellow centered, tubular flowers; men get handsome leis of dark chocolate brown kukui nuts. Will said, “This is like a heavy necklace of giant milk duds.” The greeter promptly explained the nut’s history as kukui oil-fueled flaming torches. Artistic representations of kukui appear throughout the lushly landscaped resort along with a cultivated patch of taro plants to make poi, one of the islanders’ century-old, staple foods. Wandering Aulani’s manicured gardens and groomed beach, it’s easy to imagine entire Disney theme park-scapes and movie sets embedded in the palm frond beauty. But guests have to keep a sharp eye to find traces of signature Disney dazzle. No doubt, the resort’s half-moon, swimming-snorkeling cove protected from pounding surf by lava rock boulders would be a perfect place to anchor Captain Jack Sparrow’s Black Pearl. Instead, kids love doing cannonball splash dives off the floating dock shaped like a silhouette of a giant Mickey Mouse head floating in the lagoon’s center. Another subtle reference to Walt’s world stands in the lobby’s corner — a replica of an ancient royal Hawaiian feather standard called a kahili made of Mickey’s black, white and red colors. Hawaiians are known for their quilt craft so Disney demonstrates this in the guest rooms, but with an understated circular pattern of mouse ears quilted into the bedspread that serves as a subtle reminder that guests are enjoying Hawaiian surf on Mickey’s turf. But don’t dismay die-hard Disney fans! Mickey and his gang hang out at Aulani. VIP guest coordinator Allan Lagomarsino II assured me, “The characters are here — but they’re on vacation too.” Guests of all ages who desire the iconic Disney encounter reserve seating at the special character breakfasts (up to six are scheduled each week). Also, characters appear for photo opportunities at designated resort locations at scheduled times announced in the resort’s daily ‘Iwa newsletter. Feeling nostalgic, I posed with Will with Lilo & Stitch, then with Minnie wearing a snazzy, flowered muumuu. The Aulani is centered within a 652-acre resort-residential area called Ko Olina Resort & Marina on O’ahu’s leeward side. Disney shares Ko Olina beachfront with two Marriott hotels, a condominium complex, some residential properties and the locals, as all beaches in Hawai’i are public. From our room’s balcony overlooking the Ko Olina Golf Club course and rocky coastline mountains plunging into the sea, our bellman pointed out the small shopping center across the street, a two-block walk. Aulani’s free shuttle circles Ko Olina, stopping at the shops and renowned Hawaiian Chef Roy Yamaguchi’s restaurant Roy’s next to the golf course. Our second day we shopped the center’s ABC store for flip-flops, sunscreen, breakfast basics, PB & J, bread, and ate a tasty Mexican lunch at Just Tacos. Aulani restaurants fit diverse family appetites from poolside burgers and Hawai’i’s famous shave ice dessert (a combination fruit syrup-snow cone-like treat) to prime-aged steaks, crab legs, and chocolate lava cake. For the greatest value, families chow down at the Makahiki Restaurant all-you-can-eat buffet. At dinner, a strong mix of traditional Hawaiian cuisine and all-American dishes fill the serpentine buffet. A full sushi, soup, and salad bar precedes entree selections including prime rib, Hawaiian-style barbeque ribs, pastas, pizzas, vegetable sides and desserts. Will downed roast meats, oysters and peach cobbler. While I went back for sushi seconds, I feasted my eyes on the dining room’s vibrant, Gauguin-esque murals picturing pre-missionary, bountiful Hawaiian life. On the way back to our room, we stopped into the cool ‘Olelo Room for a visual language lesson. The intimate lounge’s koa wood carvings tucked into a giant shadow-box displayed above the bar depict Hawaiian words. While young families dine at ‘AMA’AMA during a lively ukulele troupe’s performance, couples and families with older kids enjoy the gourmet restaurant’s contemporary island cuisine in later hours when soul-soothing sounds of surf serenade candle-lit conversations. We shared a scrumptious shellfish seafood platter, ceviche, and ahi tuna poke appetizers. A glass of sauvignon blanc paired beautifully with my grilled opah (moonfish). ‘AMA’AMA chefs showcase locally sourced food products such as the Moloka’i black sea salt and make the udon noodles and multigrain taro bread in Aulani’s on-site bakery. Additions to both the ‘AMA’AMA and Makahiki restaurants are in the works, part of Aulani’s expansion plans to accommodate guests who never seem to want to leave the resort. 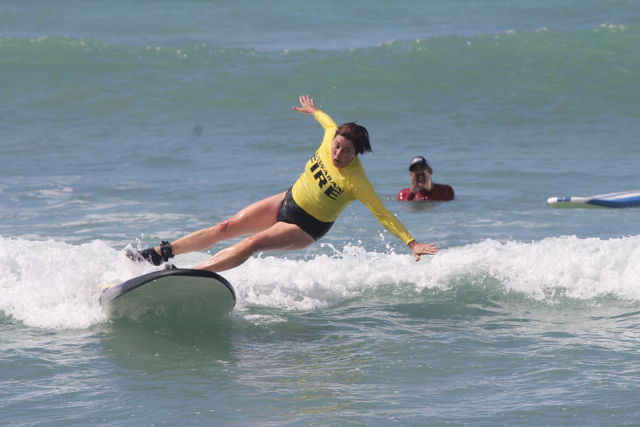 We started off our three-day stay in Hawaii Five-0 mode spending a half day surfing at a beginners’ beach, one of several Adventures by Disney off-resort, island excursions including horseback riding, kayaking, rainforest hikes and catamaran sails. Then we dove into Aulani’s Rainbow Reef pool snorkeling with tropical fish, wound our way around the lazy-river pool and selectively participated in resort organized fun. Aulani offers a full schedule of free activities from sunrise yoga and hula lessons to hip surfer-themed pool parties, volcano explosion science fair-style sessions and star gazing. Pools with playful water features keep families slathering on sunscreen all day long. 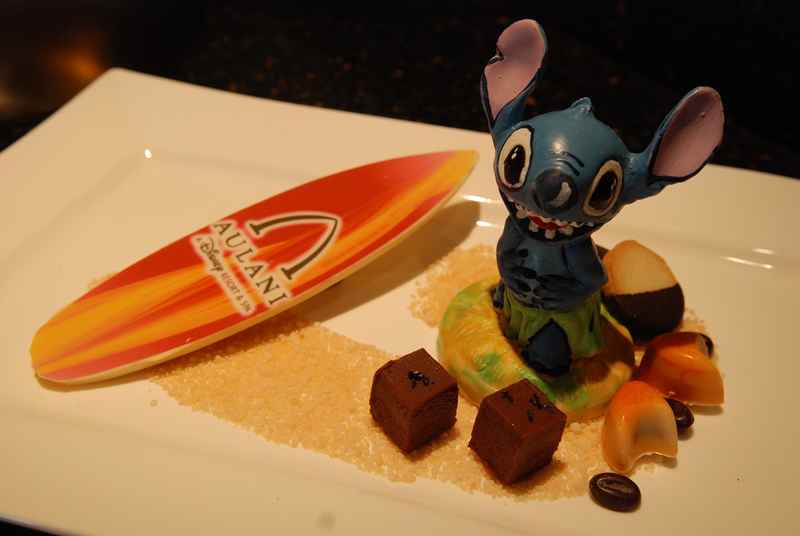 Evening ohana activities include outdoor Disney movies, a hula show, and live ukulele music. We liked the more low-key nighttime storytelling seated around a blazing beachside fire pit listening to a local storyteller share legends of Hawaiian fire goddess Pele. Younger kids love playing the free Menehune Adventure Trail high-tech scavenger hunt-style game learning about Menehune, Hawaiian folkloric little people known for magical building skills and making mischief. Guided by interactive game consoles, kids wander the resort populated with 200 Menehune wood and stone figures solving mysteries born of Menehune-mayhem. Along the way, they learn about Hawaiian history, topography, and culture. Parents like the balance Aulani offers between family time and adult alone time. Aunty’s Beach House keeps young kids busy from 10 am to 9 pm doing Hawaiian-related crafts, karaoke, and games in the vintage-style beach house. Teens gather in the sunny lounge at teen spa Painted Sky, at the D.I.Y. perfume and face mask mixology bar and on the private patio eating frozen yogurt concoctions made at the yogurt and elixir bar. In the salon, they have mani-pedis, facials, and massages. Will hung out a few hours playing computer games and taking a ukulele lesson while I got a massage at the Laniwai Spa. Laniwai means “freshwater heaven,” and the spa lives up to its name. Before pampering begins in treatment rooms identified by types of Hawaiian rainbows, guests relax in O’ahu’s only outdoor, hydrotherapy garden. I loved soaking in the scented pools and standing beneath the multi-fountain rain showers of misting, pelting, spraying and cascading warm water. Of the 150 spa therapies offered, I chose the traditional Hawaiian lomilomi healing massage. Cocooned between warm heated pads, I felt surfing soreness subside as my muscles eased and became pliant for the skilled masseur’s hands rhythmic strokes. That’s what I call magic. Aulani’s dialed-down Disney atmosphere, stellar service and authentic Hawaiian experience made my family want more Disney vacation memories ever after. Now, I even believe that next time with a sprinkle of pixie dust I can surf like Lilo and Stitch. Aulani features large, themed family pool featuring a misty grotto and an after-dark experience with glittering lights; kids’ splash zone designed to resemble a tidal pool; and additional deck space, chairs, chaises, and cabanas. There will also be the Ulu Cafe serving three meals indoors and out, plus a beachside, quick-service eatery. Since resort construction remains, you will find good rates this summer. Our spacious, king standard guest room opened to an adjacent TV-dining area with a Murphy bed, coffee maker, mini-refrigerator and small dining table. Conveniently, there’s a coin-operated laundry in the hotel. Aulani Disney Spa & Resort rates start at $484 for a standard view with 2 queen beds or 1 king bed and 1 queen-size sleeper sofa. Deluxe studios with standard views also start at $484 with queen bed and queen-size sleeper sofa. For larger families looking to splurge, Parlor Suites with partial ocean views start at $1,132 with a King bed and Queen-size sleeper sofa, and one bunk-size pull-down bed or one King bed and one Queen-size sleeper sofa and a bunk bed. In other words, you’ve got tons of space, views, and creature comforts on your Hawaiian vacation. Our spacious, king standard guest room opened to an adjacent TV-dining area with a Murphy bed, coffee maker, mini-refrigerator and small dining table. Conveniently, there’s a coin-operated laundry in the hotel. Rates include most on-site activities like Aulani pool parties with Disney character appearances, kid-friendly fun at Aunty’s Beach House, Cove splash zone, live entertainment, adventure trail, fire pit storytelling, Disney movie nights, and ukulele lessons. For an additional fee, guests can indulge salon services and embrace their inner adventurer like sailing canoe excursions. Keep an eye on off-season rates and specials or use this handy trip planning video. By the way, Aulani does not provide resort-airport shuttle service. Generally, it’s a flat rate of around $100 for the 17-mile trip to and from Honolulu International Airport (O’ahu transportation companies include SpeedieShuttle and The Cab). Booking ahead, especially during school holidays, is essential, as Aulani books up quickly. For more information about Aulani, A Disney Resort & Spa, call their agents at 714/520-7001 or visit the Aulani website.